Sacrifice target creature and all others of its element. Each one adds 1 card to your hand from the opposing element. 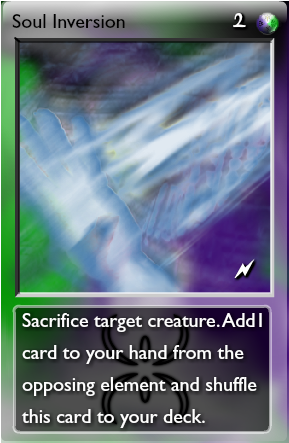 Sacrifice target creature. Add1 card to your hand from the opposing element and shuffle this card to your deck. "Today is a good day to keep in good spirits"
"Today the souls of the broken shall become the very thing they once resisted." The unupgraded version is a less controlled variant. It focuses on burst production at the expense of possible loss overproduction (e.g. 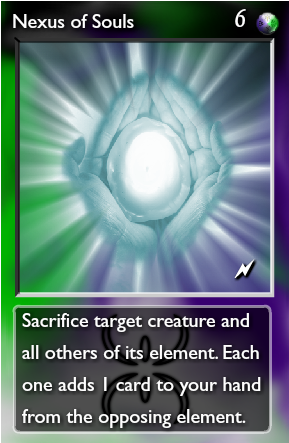 if you sacrifice more creatures than you have free slots in your hand, the excess is wasted). 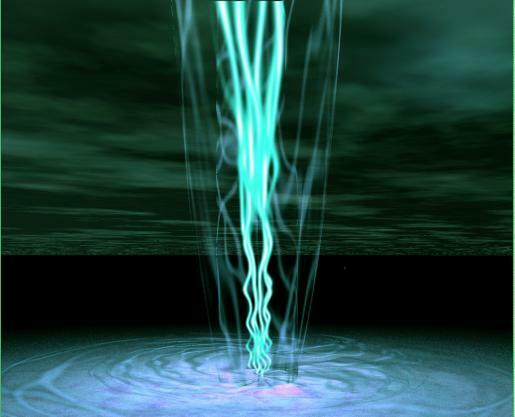 The upgraded version produces spells much more slowly but there is no risk of overproducing. Moreover, it provides an anti-deckout capacity as long as you don't run out of creatures. Since any of the spiritual elements ( ) can be used to power this spell, it could potentially be splashed into other decks or in rainbows.